When you become an adult, you can officially have cake for breakfast! So why not eat a cake that is infused with our favorite ingredient- coffee?! Preheat oven to 350 degrees. Grease three 8-inch round pans or four 6-inch round pans with nonstick cooking spray. Sift together cake flour, baking powder and soda, salt and espresso powder. In the bowl of your mixer (or beaters), cream butter, oil, and sugar, until light and fluffy. Reducing your mixer speed to low, alternate adding flour mixer and milk until just combined. Whisk in hot coffee. Batter will be runny. Evenly fill cake pans half full with batter. Bake at 350 degrees for 25-27 minutes for 8-inch pans and 22-25 minutes for 6-inch pans, or until a knife is inserted and when removed is clean. Combine butter and mascarpone in the bowl of your mixer and beat on high until smooth. Add 1/2 of the powdered sugar and beat on low until smooth. Add vanilla extract, espresso powder, and remaining powder sugar. Beat on low until combined. Once combined, increase mixer speed to high and beat for 4-5 minutes. To assemble the cake, place one layer on a cake plate and frost it with the 3/4 cup of frosting. Repeat with remaining layers and frost the outside of cake. Refrigerate cake for 1 hour before adding ganache. To make the ganache, heat cream in a microwave safe bowl for 1 minute. Once hot, add chocolate chips and let sit for 5 minutes then stir until smooth. 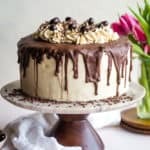 Drizzle cold cake with ganache. Top with remaining frosting swirls, espresso beans, and jimmies, if desired. Serve with a piping hot cup of Seattle's Best Coffee and enjoy!